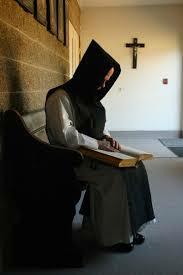 As I write this letter to you I am on retreat with the Trappist monks at the Abbey of the Genesee in Piffard, NY. Mass has just finished and I grabbed a few pieces of toasted Monks' Bread (the major means of income for this monastery) before I sat down to write. I will be working in the specialty bakery (where they bake items like biscotti and other specialty items) later today. There are some practical matters that I must tend to, even while on retreat. As with all of the other parishes of the Camden Diocese we have recently begun our Catholic Strong campaign. You might have noticed the banners or signs around some of our buildings and grounds. Like many of my fellow priests, I enjoy being a priest and taking care of my sacramental duties. However, the cross that most pastors must face is the everyday administration of the parish. Let's face it, who would want to take over a parish that currently has 12 buildings [3 churches and a worship site, 3 rectories, 2 school buildings, a ministry center (former convent or carriage house), a convent, a recently purchased property (81 Cooper St.) intended as a future parish office building] and 2 garages. The parish also has $2.5 million in current debt. To remedy some of this situation, we are under contract to sell the entire campus of the former Most Holy Redeemer Church. This sale will lessen our total buildings by 4 and help to reduce some of the accumulated debt. Next, concerns how our Catholic Strong campaign is vital to the future of this parish. Many of our building are old and in need of repair. The roof in St. Patrick Church is leaking near the area where the choir sings. Heating and air conditioning systems (HVAC) are antiquated in various buildings. For instance, the rectory at 64 Cooper St. is steam heated with a boiler nearing the end of its life. Various sidewalks and driveways need repair. Please note the driveway heading into the school property from Green Ave. The retaining wall around St. Matthew Church is falling down. The newly purchased building at 81 Cooper St. needs considerable work before we can completely move in (some construction and repair including replacement windows, bathrooms, internet access, security cameras, phone system, furniture, etc.) This is just some of what we know needs to be done. What about the unexpected? Need I go on? Bishop Sullivan set up the Catholic Strong campaign so that 70% of all money raised stays in the parish for its use. This is unheard of as diocesan capital campaigns go. The remaining 30% goes to support diocesan programs intended to directly aid the parishes. This is not the same as the annual House of Charity appeal which is geared primarily towards various diocesan programs. Does it seem like a great time to be asking for your financial help? Are you kidding me? Of course not. However, there is far too much to be done at the local parish level that will only get worse if it is continually neglected. I can only make my case and trust that you will consider what you have to do in your own homes regarding regular maintenance, upkeep and repair. Now multiply this by about a dozen or so aging or antiquated buildings and you see what the parish is up against. Moreover, in terms of parish ministry, we want to put some money aside for the evangelization and support of youth and young families. If I or one of the members of the parish team calls to ask for your help, please take the time to listen and respond. I hate asking anyone for money. However, it is on behalf of your parish and our future that we ask your financial help. Now I need to get back to some serious prayer. Please pray for me as I will for you.